It provide opportunity to young youth talented urban students work as a NGOs working on growth projects in rural India with knowledgeable manpower whose skill sets can be used to catalyze rural development and share creative ideas and contribute to rural development throughout their professional life. Shortlisted Candidate will be notified via e-mail and/or SMS. After completing the selection process the team member of the department will be sent the offer letter specify details of the programme, fellowship support and terms and conditions of the fellowship. After that interested candidates have to register and fill the form. Shortlisted candidates are notified on an ongoing basis during the application period. 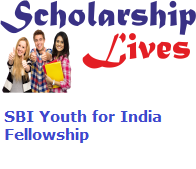 Focus Point: If you have any query about the SBI Youth for India Fellowship 2019 then frankly ask through the comment box which is mention below.